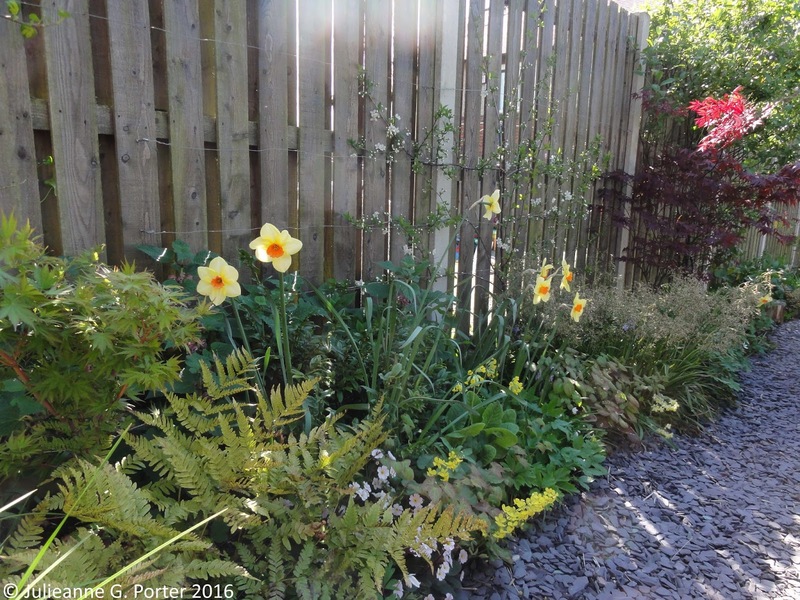 In recent posts I've mainly been blogging about gardens to visit and Spoonie Veg, so I thought it was time to do a general update of the garden. 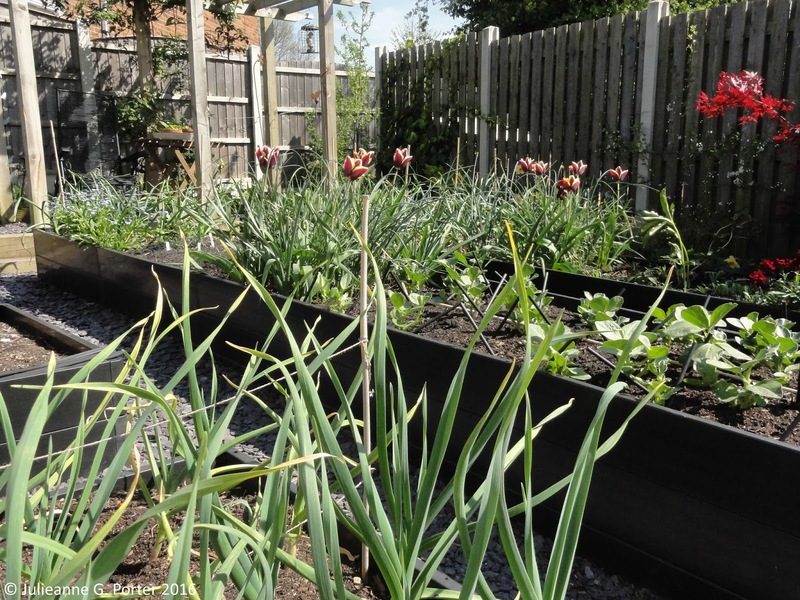 In my small kitchen garden I've kept to my decision last October to reduce what vegetables I'm growing this year. 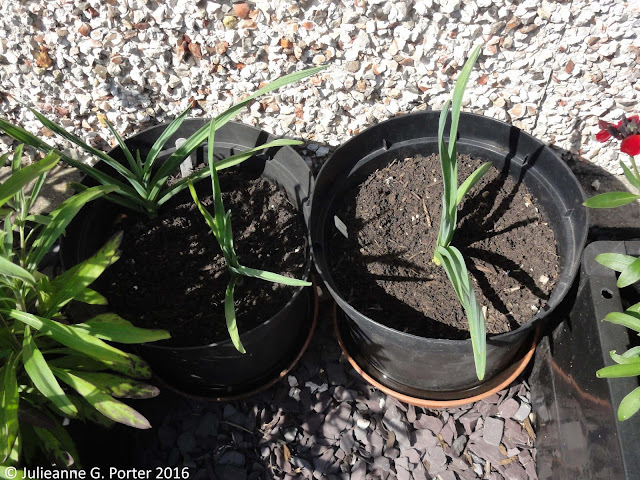 I'm growing more garlic, as it's so damn easy and I want more to choose from when it comes to saving 'seed' when they are harvested. I have 8 different varieties, all less usual Hardneck varieties (more info on the varieties from a 2013 garlic post), with different levels of strength in taste. 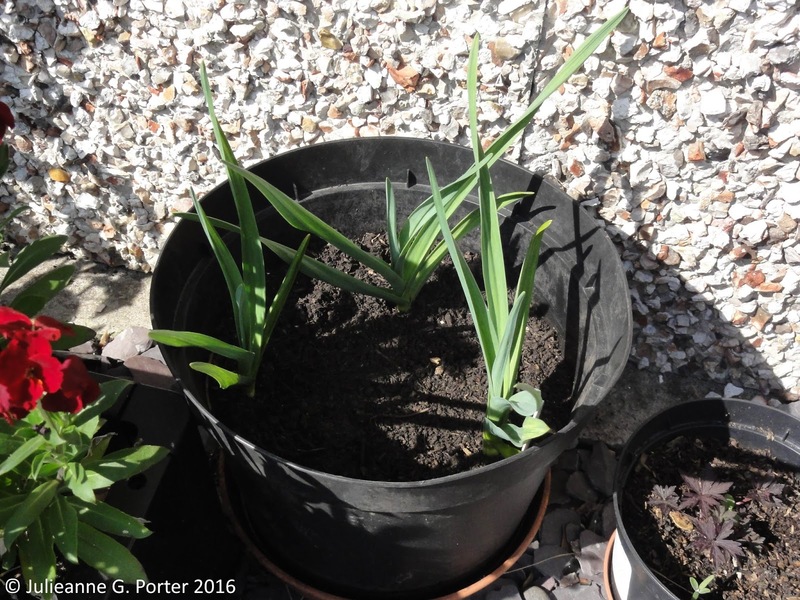 I'm also experimenting with growing garlic in pots, to see what the optimum number of cloves is for getting decent sized bulbs when growing in containers. Here are my three pots and they are all looking healthy. I'll do a full garlic report when I harvest, late July-ish. I'm growing broad beans, because I adore them and there is just nothing like eating freshly picked broad beans. Nothing else compares. I sowed late (early April) as that's when I finally had the ME spoons to prepare the bed then sow. I've pinched out the tips so they develop more stems, which of course means more beans. Yum. My first carrot and parsnip seedlings are up. Carrots can be a bit of a faff with the way I seem to be unable to beat the darned Carrot Fly. Last year, including sowing & immediately putting on horticultural mesh and keeping them covered the whole growing cycle, I STILL got carrot fly. So this year I'm growing more parsnips, which crop well with little hassle. 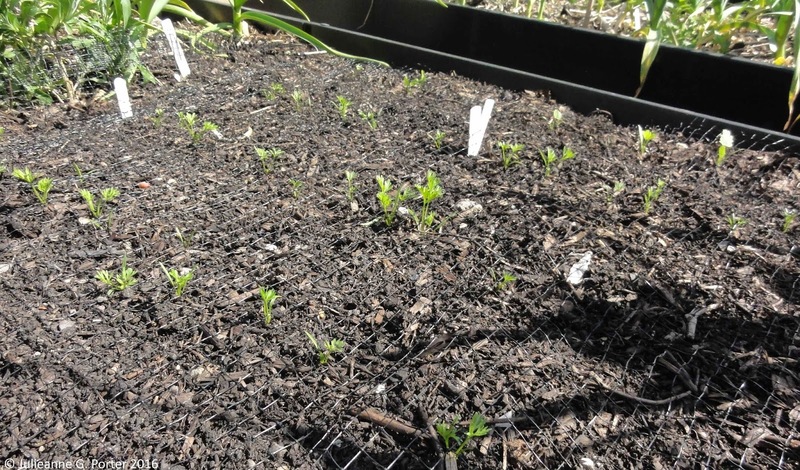 I sowed them each side of the bed, with some carrots in between. I thought since parsnips are so much taller they might give the carrots some protection and confuse the Carrot Fly. I'm not covering the carrots, they either do well or not. I am planning on sowing some smaller varieties in pots to see how they go. I've only just sown my courgettes, pumpkins/squash and dwarf french beans, which is why there are some empty patches of soil. With this warm weather they should germinate quickly. 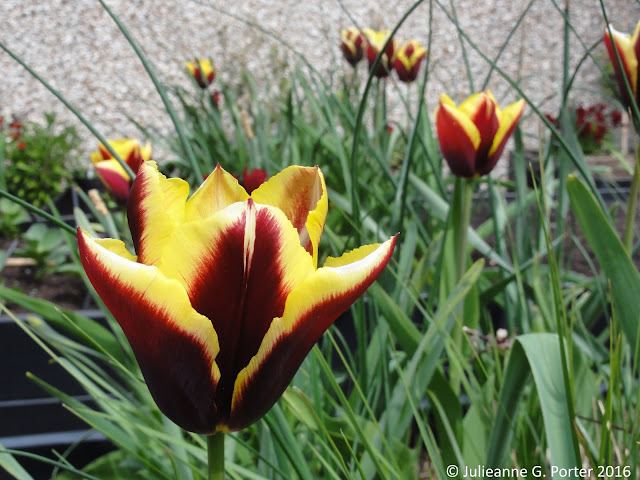 And with the threat of it turning cooler again, I'm in no rush to plant them out until the end of May or early June. I've been harvesting Sorrel since April, making dishes like Sorrel and Mushroom Pasta and Sorrel and Potato Gratin. And I can now start harvesting Ramsons (below), wild garlic. Thanks to Alison at Backyard Larder I discovered that the leaf, stem and flower are all edible. I'm looking forward to tasting them. Having reduced the amount of vegetables I'm growing, I've added some grasses and bulbs to the middle of each long veg bed. 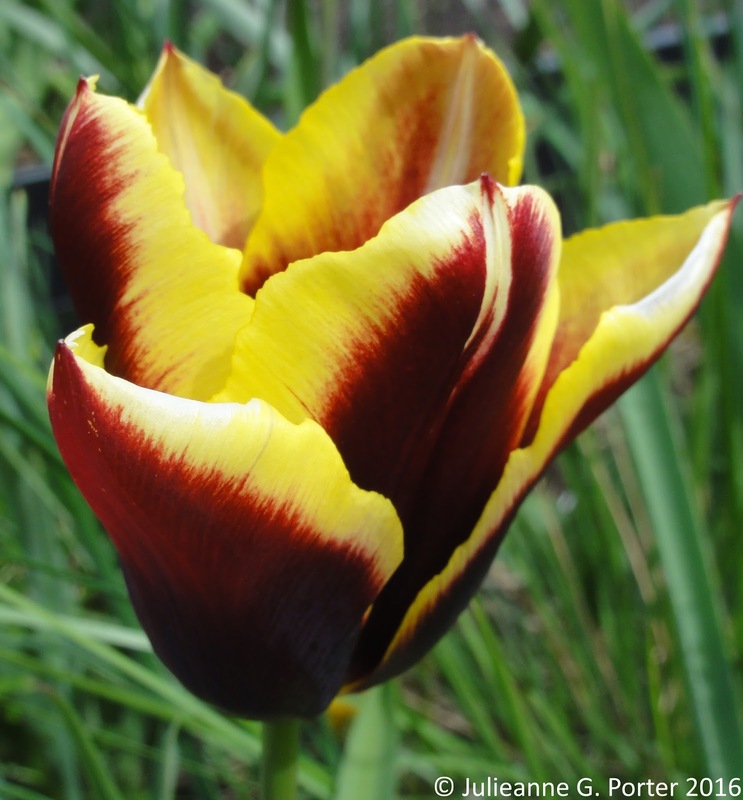 Already flowered has been Narcissus Rijnvelds Early Sensation and currently flowering is the slightly outrageous Tulip Garvota. I'm in love with this tulip. I can see it from the kitchen and boy does it brighten up a dull day. Next up will be Allium Christophii and Allium Sphaerocephalon, then by late Summer as the bulbs have all died down, Pennisetum alopecuroides 'Hameln' and Stipa gigantea will take the stage and carry through until late winter. 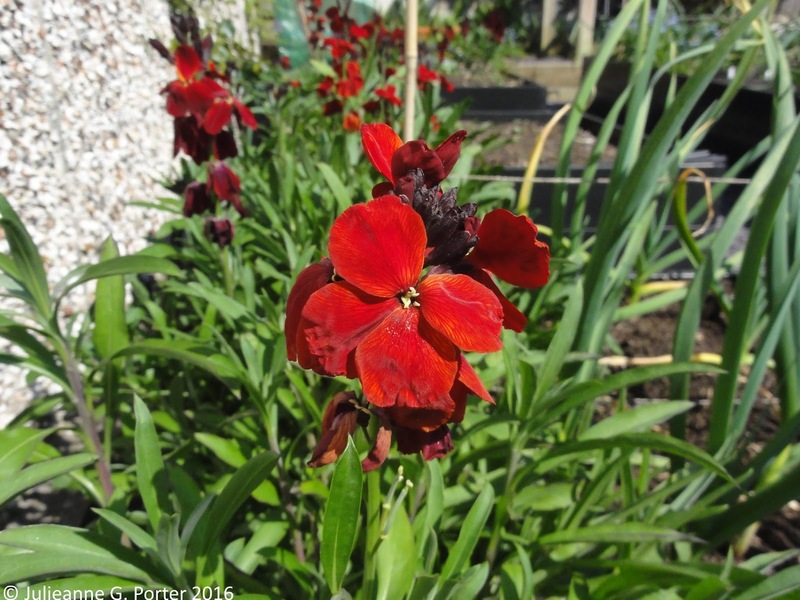 I've sown some annuals in one bed, and am very happy with this, sown from seed last year, Erysimum cheiri 'Vulcan'. It goes rather well with T. Garvota too. I've also planted Trachelospermum jasminoides 'Majus' to grow up the garage wall. It's been an eyesore for too long. 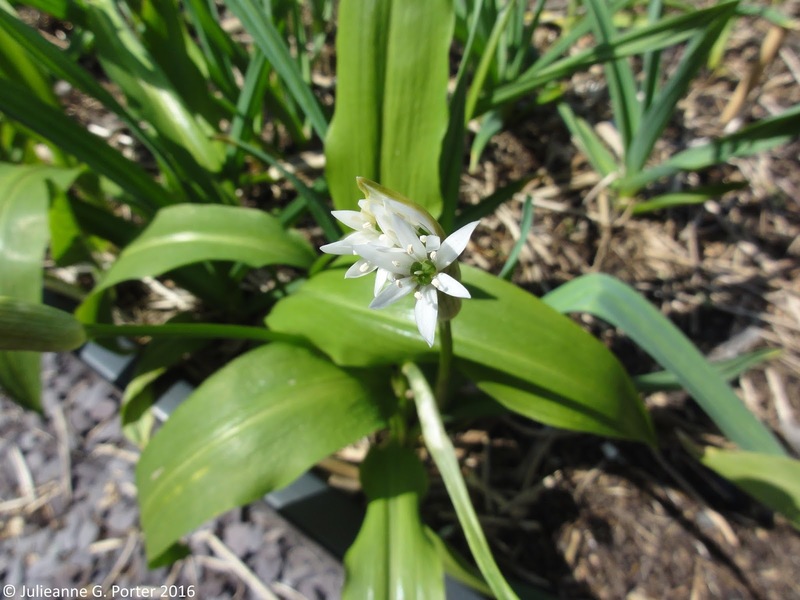 I got it from Colin at Swines Meadow Farm Nursery, and though its only been in the ground since early April, it's already got lots a growth to show for it.The flowers, which unfold in Summer, are white and fragrant. I'm looking forward weeding next to it in flower! 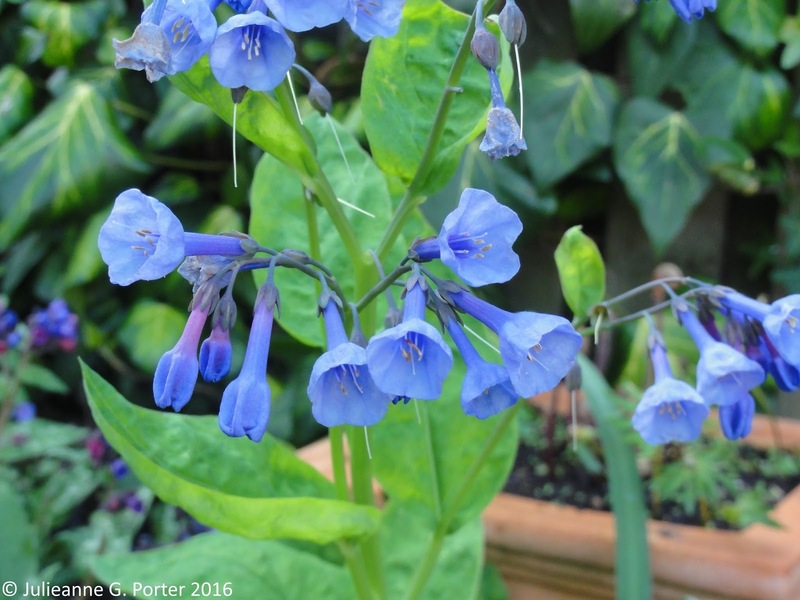 I was delighted to discover last week that the Mertensia virginica that I planted two years ago, then disappeared and thought dead, suddenly popped its head up and is flowering again. Yay, I didn't kill it after all, it just needed a long think. 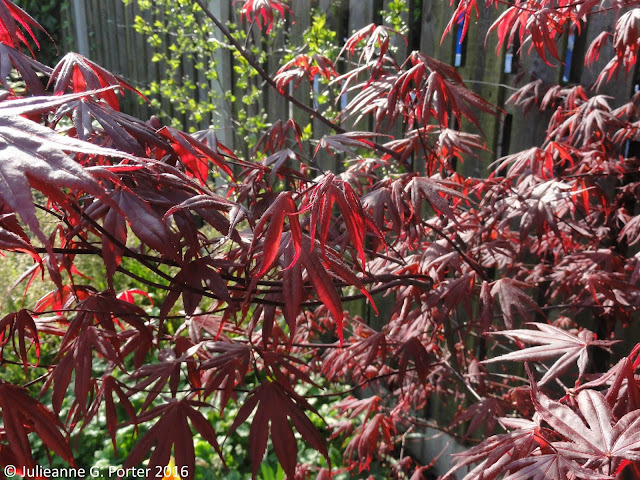 Acer palmatum 'Bloodgood' has put on another beautiful late Spring display. I love the way the sun catches the young leaves, it kind of shimmers. In general the top end of the Long Shady Border is looking good and the Morello Cherry growing on the fence is branching out and flowering - maybe I'll get some cherries this year? 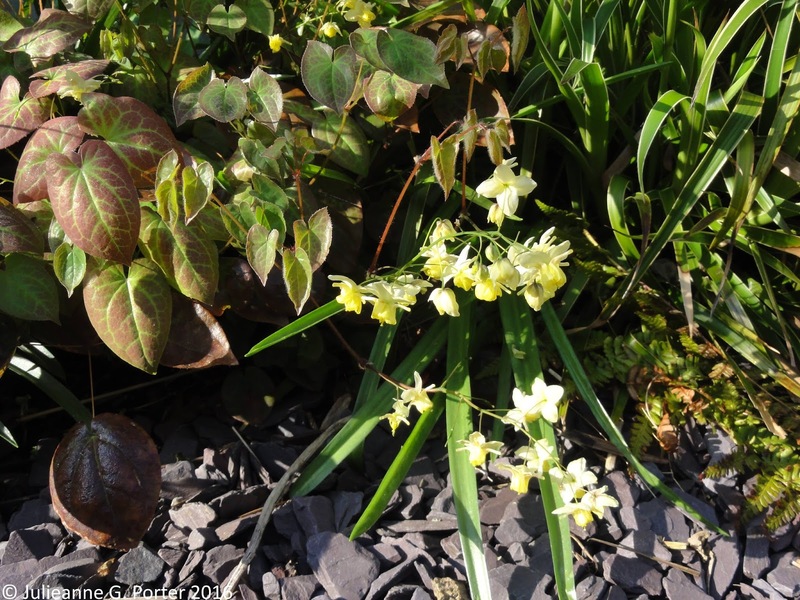 There are a lot more flowers and new leaves on Epimedium x perralchicum 'Frohnleiten'. As well as on Epimedium x versicolor 'Sulphureum'. In general I'm happy with this end of the border, I just need to move Dryopteris erythrosora which is getting a bit big for its boots and over shadowing some smaller plants like Primula Guinevere. I'm not happy with the other end of the Long Shady Border, which includes the Bog Garden, and that is why there is no picture here. I've realised what I need to do to improve that end, but I'll leave that for another post. 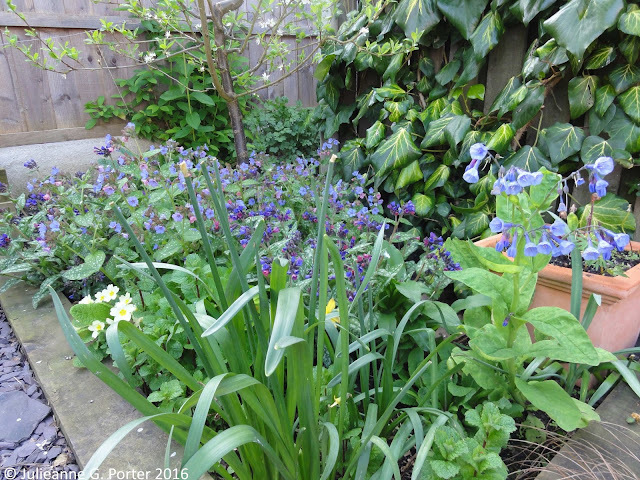 Conversely, I'm happier with the greengage border, next to the compost bins. Kevin helped me dig out more of the heavy acid clay (ok, he dug it out, I directed) and I've added a 2nd Stipa gigantea to this border, an along with those in other borders, I'm hoping this will bring a bit more cohesion to the garden as a whole. I've have a purple Geranium pratense Midnight Reiter to add, and I've put down woodchips to mulch and help it look less like heavy clay whilst the plants fill out. The Greengage itself if looking healthy and growing. Will I finally get some blossom on it this year? 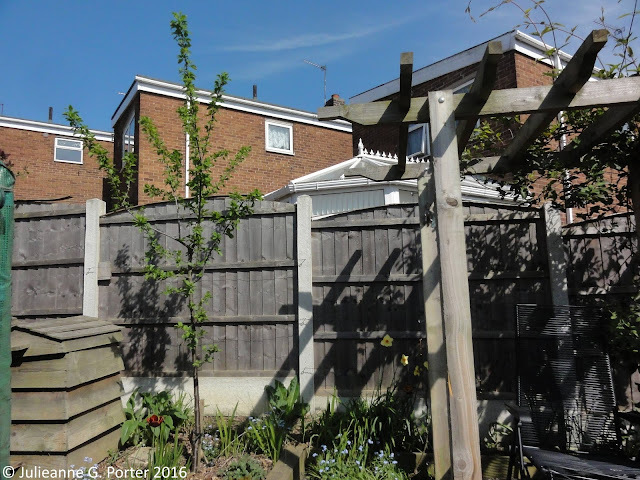 To the right, growing up the pergola, is Lonicera similis var. delavayi. It's taking off with a bang this year, so I need to do some tying in to train it, both on the pergola and along the back fence. This year, by late Summer, I'm hoping that it will finally mean that the back of the garden has more green and less fence. On the whole, I'm pretty happy where there garden is at this stage in the season. I'm taking a much more relaxed approach this year, not feeling I have to do everything, in order to continue to get better at managing how I garden with ME. For some reason my sweet peas didn't germinate (I think they rotted in their pots when I was on holiday in Scotland for 2 weeks), so I've just gone and bought some from the garden centre rather than try again myself. The world won't fall apart if I don't do everything myself. The garden is in a good place, and I'm enjoying it. 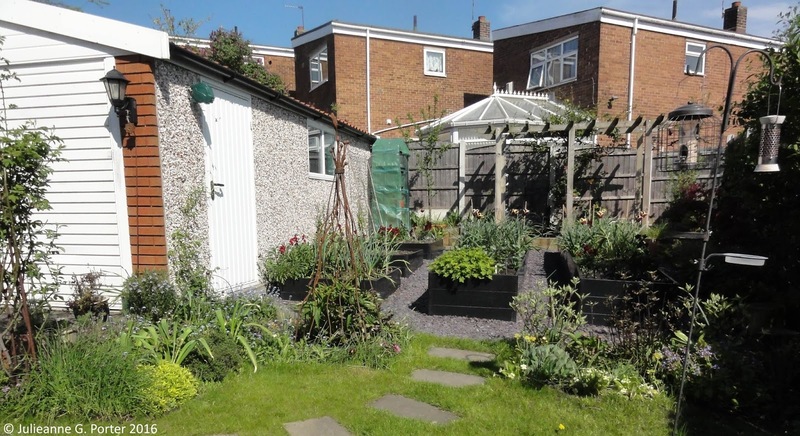 I hope you are enjoying your gardens and allotments too. 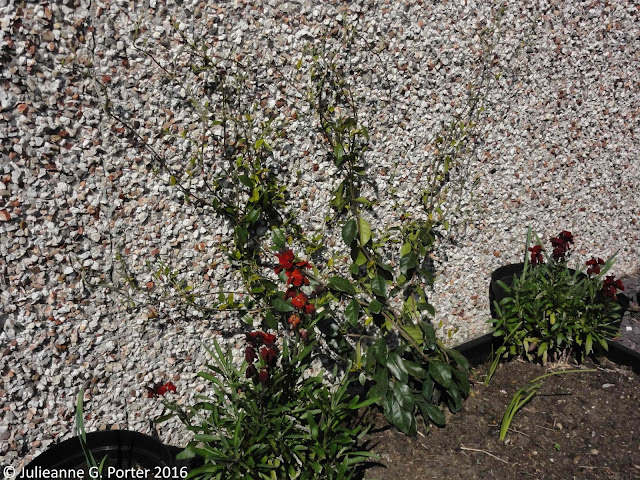 Herb border to the left, and the purchased sweet peas will be placed to grow up the obelisk. It's all looking great. Fingers crossed for the carrots, although that's clearly in the lap of the tiny winged carrot-fly gods. 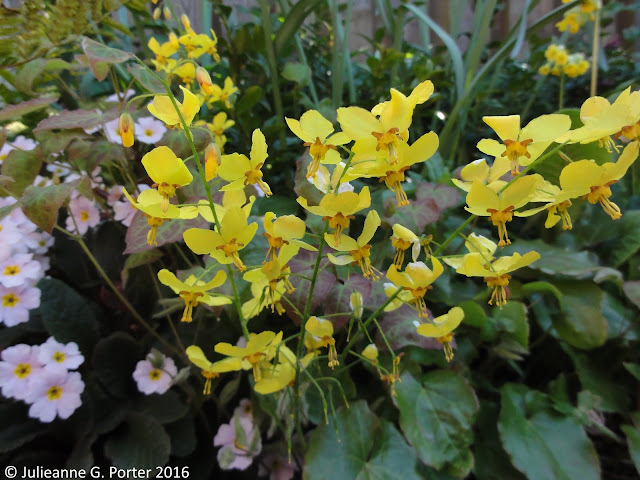 I love the swept-back look of the Epimedium x perralchicum. Like with Erythronium flowers, it's like they've just pressed the warp-speed button and gone into hyperspace. Thanks J-P. Best ever description of Epimedium x perralchicum & Erythronium flowers! That Mertensia is gorgeous, not come across it before. What a fabulous blue. Wow! Amazing photo. I like it. organic gardening pesticides are less expensive than buying and applying pesticides, and it's safer for your garden.Organic gardeners can use certain pesticides -- chemicals that are derived from botanical and mineral-bearing sources.